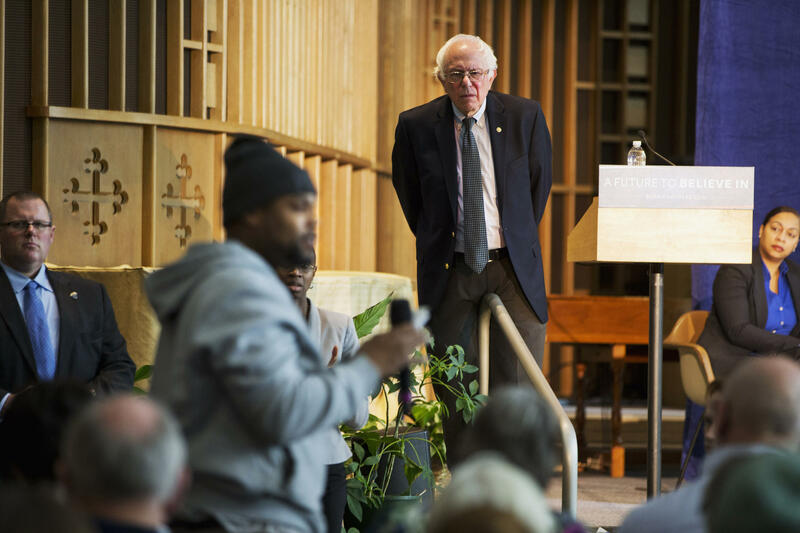 Democratic presidential candidate Bernie Sanders listens to concerns about contaminated water during a community forum at Woodside Church in Flint, Mich.
On Sunday, after Bernie Sanders' commanding wins in the Alaska, Hawaii and Washington state Democratic presidential caucuses, Leslie Lee III, an American freelance writer living in Japan, tweeted, "I knew it. I knew if Bernie won Hawaii it would magically become a white state." And then he tweeted again: "Ever since I voted for Bernie, I've been bingewatching Friends. #BernieMadeMeWhite." Lee said he wrote that to contradict a narrative he sees playing out in the race for the Democratic nomination. "There's always been these articles about how Bernie supporters are basically only white people," Lee told NPR. He continued, "Me, myself, and many other POC, people of color, who support Bernie Sanders, feel like we don't get to be a part of the conversation. We get ignored. We get erased. It's assumed that the black vote, the Hispanic vote, and everyone is all behind Hillary Clinton and none of us really get Bernie Sanders or like Bernie Sanders." So he decided to have fun with it. "Hey, if you're gonna ignore me as a black person, I might as well embrace my whiteness," Lee said. "I might as well start watching Friends, or enjoying pumpkin spice latte, or whatever. I just wanted to have a bit of fun with it while highlighting the serious issue." It was a strong, and, at times, hilarious showing for Sanders' supporters of color, one that might seem to be in contradiction with the Vermont senator's actual electoral support from minorities so far in this election. Sanders himself admitted to struggling to win the black vote. After a disappointing loss in South Carolina's Democratic primary, where Sanders only won 14 percent of the black vote in that state according to exit polls, he told ABC's George Stephanopolous, "We got decimated." In another interview with the Los Angeles Times editorial board, Sanders said, "Older African-American women, I think we found two in the country that voted for us in the South." "I would attribute this to number one the popularity of Bill Clinton and Hillary Clinton — you know it's a brand name," he continued. "They've been known by the African-American community for 25 years, and they are popular." So which point of view is correct? Sanders does horribly with minority voters? Or the media do a bad job of telling the story of Sanders' existing minority support? "Well, I think, looking at the exit polls," Randy Brown of Edison Research told NPR, "they're both correct." Edison conducts entrance and exit polling for American elections and has conducted polls on primary voters and caucusgoers in 20 states so far this election. Brown said, by some measures, Sanders actually leads among black and Latino voters. "Among African-Americans, who are 17 through 29, Bernie Sanders is actually leading that group, 51 to 48 [percent]," he said. "Among 17- to 29-year-old Hispanics, Bernie Sanders leads Hillary Clinton 66-34." "I think the big takeaway," Brown said, "is that whether it's among whites or African-Americans, Bernie Sanders does significantly better among the youngest voters in the Democratic primary." For what it's worth, Lee said he hopes his hashtag helps spread that narrative. But he also told NPR that he is not sure #BernieMadeMeWhite will actually make anyone change a vote. "It helps connect progressives on Twitter," Lee said. "I think that's the main point. It's not going to convince people in the media that they're wrong. It's not going to convince people who support Hillary Clinton that they're wrong. But it is going to help connect people who do support Bernie Sanders and, more importantly, believe in progressive values." And after Bernie Sanders won decisive victories in this past weekend's Democratic caucuses in Alaska, Hawaii and the state of Washington, some of his supporters took to Twitter with the hashtag Bernie Made Me White. It trended for hours. NPR's Sam Sanders reports they're aiming to shed some light on what the mix of Bernie Sanders supporters really is. SAM SANDERS, BYLINE: Leslie Lee III says he started the Bernie Made Me White hashtag for a simple reason. LESLIE LEE III: There's always been these articles about how Bernie supporters are basically only white people. S. SANDERS: Lee is black and a Sanders supporter. I talked to him via Skype. Lee says Sanders wins in diverse states like Hawaii and Alaska prove that Sanders is winning minority support. But, he says, media coverage only talks about Sanders' white voters. LEE: Myself and many other people of color who support Bernie Sanders feel like we get ignored. We get erased. It's assumed that the black vote, the Hispanic vote, is all behind Hillary Clinton and none of us really get Bernie Sanders or like Bernie Sanders. LEE: Hey, if you're going to ignore me as a black person, I might as well embrace my whiteness, you know? I might as well start watching "Friends" or enjoying pumpkin spice latte or whatever. S. SANDERS: And the hashtag took off. One black supporter tweeted, ever since I started supporting Bernie, "Don't Stop Believin'" became my karaoke staple. A Latino supporter wrote, after I supported Bernie, I stopped rolling my Rs when I speak in Spanish. Another - now the cops don't pull me over as much. And another - finally, I have white privilege. OK, you get the drift. But in spite of that hashtag, in spite of those vocal Sanders supporters of color, even Bernie Sanders himself has admitted to doing poorly with minority voters. After he won only 14 percent of black voters in South Carolina's primary, Sanders said this. BERNIE SANDERS: We got decimated, George. We got decimated. S. SANDERS: He was talking to George Stephanopoulos of ABC News. Sanders also said this to the LA Times editorial board. B. SANDERS: Older African-American women, I think we found two in the country who voted for us. S. SANDERS: So who's right? Are the so-called mainstream media correct when they say Sanders does poorly with minority voters? Or are the media doing a pretty bad job of telling the story of Sanders' existing minority support? RANDY BROWN: Well, I think looking at the exit polls, they're both correct. S. SANDERS: That is Randy Brown of Edison Research. He also talked to me via Skype. Edison has done exit polls in 18 states so far this primary season. And Brown says Sanders is actually winning the minority vote if you look at a certain subset of it. BROWN: Among 17 to 29-year-old Hispanics, Bernie Sanders leads Hillary Clinton 66 to 34. Among African-Americans who are 17 to 29, Bernie Sanders is actually leading that group 51 to 48. S. SANDERS: In other words, Sanders wins young Latino voters 2 to 1 and even has majority support among young black voters. Now, some caveats - Edison hasn't done exit polling in every state that's voted so far, and they did no exit polling in Alaska, Hawaii and Washington state - the ones that held Democratic caucuses over the weekend. And there isn't enough data yet to draw conclusions about the young Asian-American vote. But Brown says there's still a big take away. BROWN: Whether it's among whites or African-Americans, that Bernie Sanders does significantly better among the youngest voters in the Democratic primary. S. SANDERS: And maybe there are two other takeaways. One, no racial group is a monolith. And two, young people can disagree with their parents regardless of their race. Sam Sanders, no relation, NPR News, Washington. Transcript provided by NPR, Copyright NPR.